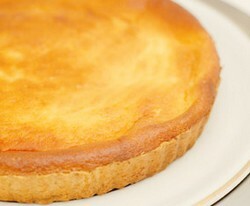 Baked Italian cheesecake : an authentic recipe from Sicily. 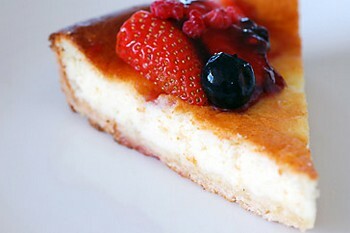 Italian cheesecake : an authentic recipe from Sicily. Always wanted to know how to make a real Italian cheesecake? Here's our quick and easy recipe. All Italian cheesecake has ricotta cheese at its heart, and this recipe is no exception. It's a baked recipe, simple to make and delicious to eat! Why a baked Italian cheesecake recipe? It's very easy to make, and it makes the cheese filling lighter and fluffier. After cooking you'll see the finished cheesecake is not as fluid as some - it's more like a tart. It's important not to overcook this cake and to use a very moderate heat, otherwise the filling can become rubbery. Like most Italian dessert recipes, this one is very rich and not for those on low calorie diets! The addition of lemon rind to the pastry base - a real Sicilian touch - gives it a gorgeous tangy flavour. ✱ Preheat the oven to 190ºC, 375º, gas mark 5. ✱ Put the flour into a mixing bowl. ✱ Cut the butter into small cubes; add to the flour and 'rub in' until the mixture resembles fine breadcrumbs. ✱ Stir in the sugar and lemon rind. ✱ Add the egg and stir together into a dough. Don't be tempted to add more liquid - the pastry will be too hard. ✱ If you have time, wrap the dough in cling film (Saran wrap) and leave in the refiregerator for twenty minutes while you make the filling. This wil make it easier to handle when you are rolling it out. If you don't have time it's not a problem. ✱ Once chilled, roll out and place in a greased 25 cm flan dish. ✱ Prick the pastry all over - this will stop it bubbling - and bake for 7 - 10 minutes, until it turns golden brown. Remove from the oven and set aside until your filling is ready. ✱ Once the pastry is cooked, turn the oven tempearature down to 150ºC (300ºF, gas mark 2). ✱ Drain the ricotta by placing in a sieve. ✱ Once drained, put into a mixing bowl and add the caster sugar, orange and lemon rind, cream and egg yolks (set the whites aside for use later). ✱ Beat together using either a hand whisk or an electric hand whisk which will make it much quicker. ✱ In a separate bowl, place all the egg whites and whisk until they form stiff peaks. ✱ Add the egg whites to the cheese mixture a little at a time, folding in gently. ✱ Spoon the filling into the prepared pastry case. ✱ Bake for approximately 40 - 45 minutes. When cooked the filling will be golden brown and firm to the touch. ✱ Turn the oven off, leave the door open and allow the cheesecake to cool down in the oven. ✱ To make it look really special, decorate it with whichever fruits are in season. Berries look particularly good. Loving this Italian cheesecake and want more rich desserts? Try this most famous of all Italy's dessert recipes : a quick and easy Tiramisu. If you love Italian cheeses but prefer savoury recipes, this scrumptiously delicious savoury Tiramisu recipe will be exactly what you're looking for.